If you are like most people, you fear death. You may not think about it every day, but admit, there are times when you feel its empty, absolute presence, and it brings a whole host of primal and existential feelings up from where you hid them, somewhere in the vicinity of the small intestines. It’s natural. We all do it. In “Smoke Gets in Your Eyes,” Caitlin Doughty argues that America has created a culture of death that makes us fear it more than we should. We take such great pains to hide and prevent it, that when the time comes we are terrified and don’t know what to do. In her memoir, Doughty discusses the modern rituals of death through her experience as a crematory employee. Her voice is hilarious and cynically optimistic (if you can fathom that). At the end I felt, if not a little less scared, a little more accepting of our human inevitability. 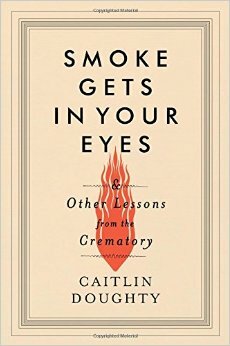 This entry was posted in Book Reviews, Other, Recommended and tagged book review, books, Caitlin Doughty, Crematory, Death, Memoir, nonfiction, Smoke Gets In Your Eyes. Bookmark the permalink.